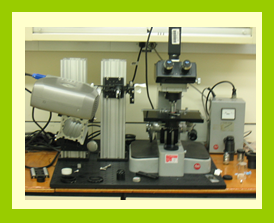 1) Video-rate confocal microscope located at the back of the optical table. 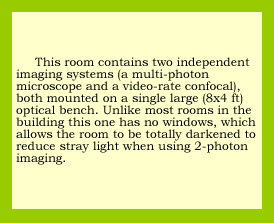 2) The multi-photon microscope system. Its features include: femtosecond excitation at wavelengths 710-990 nm; video-rate (30hz, 450x400 pixel) imaging; multiple-emission wavelengths selected by computer-controlled filter wheel; computer-control of focus; DIC-IR imaging; patch-clamp for whole-cell recording from brain neurons. 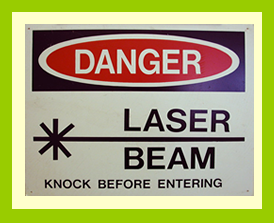 The femtosecond laser for multi-photon excitation. 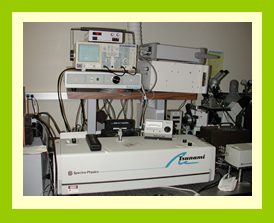 Spectra-Physics Tsunami, with 5W Millennia pump laser. Ist-Rees spectrum analyzer to monitor wavelengths and mode-locking. 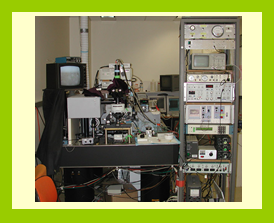 Data acquisition and analysis systems. 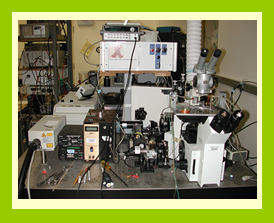 The right-hand computer converts the signal from the multi-photon microscope into a standard RS170 video signal. This is then acquired by the middle computer, running the MetaMorph software package (Universal Imaging Inc.). 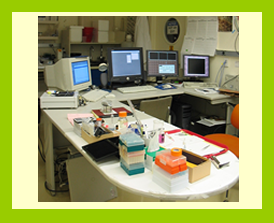 The left-hand computer runs pClamp (Axon instruments) for electrophysiological stimulation and recording. 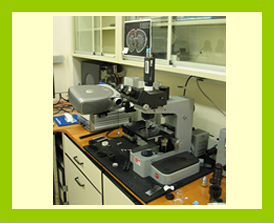 New to the Multi-Photon Laser Lab a computer program, projector,and microscope system that functions similar to confocal microscopy only more affordable. 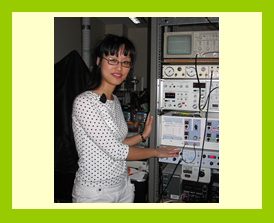 Sindy Wei, a M.D., PhD. Graduate Student from the Chalan Lab uses the multi-photon microscope system to explore the motility of dendritic, T, and B cells in the lymph node.